In 3 1/2- to 4-quart slow cooker, mix sweet potatoes, pineapple with liquid, broth, onion and gingerroot. In small bowl, mix barbecue sauce, honey and ground mustard. 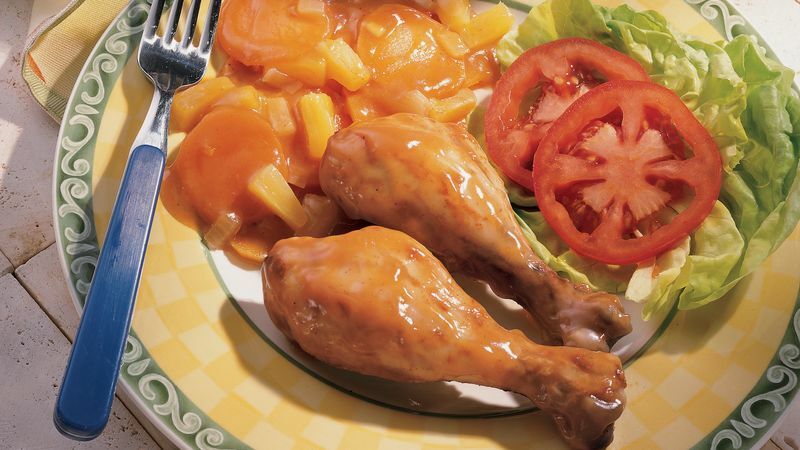 Coat chicken drumsticks well with barbecue sauce mixture. Arrange chicken in single layer over potato mixture in slow cooker, overlapping slightly if necessary. Spoon any remaining barbecue sauce mixture over chicken. There are two types of sweet potatoes available in most supermarkets. Dark-skinned sweet potatoes with deep orange flesh are more moister and sweeter than the pale-skinned variety with light yellow flesh. For this recipe, the dark-skinned sweet potatoes are ideal.